Inspired by the Irish National Day, we designed a massive special for you, commanders! Missions and rewards are nice, so I will do those. 50% discount on equipment and consumables is always welcome, even though I think I stocked up enouggh last time for the 13 tanks I have unlocked but not yet bought because I am waiting for discoutns. Which brings me to my last point: 10% discount on T8-10? 10% WG? Really??? Since when is this a thing? Lowest discount you had for T8-10 was 15%? If this is a new policy for WG, please, please tell me that the blueprints you are introducing will stack with these kinds of discounts in the future, cuz 10% is still a discount, but kinda lame moving away from the 'standard' 15% you used to have. Edited by undutchable80, 15 March 2019 - 08:29 AM. Maybe they ran out of Irish stereotypes and moved to a Scottish one instead. Blueprints are discounts for exp, not credits. I feel like this game became some kind of social experiment where WG tries to piss people off on every possible occasion. Ah crap, you are correct. Thank you. gj on that special, really nice! More than what FL will give ... I too really can't understand those WG discount policies. NIce, but when i will get the missions from last week, i didnt get emblems or premium day ? Wonder if this 10% stacks with the Christmas discount? Will find out tomorrow. lmao 10%.......what happened to 15% ????? I WAS PREPARED FOR 15% !!! 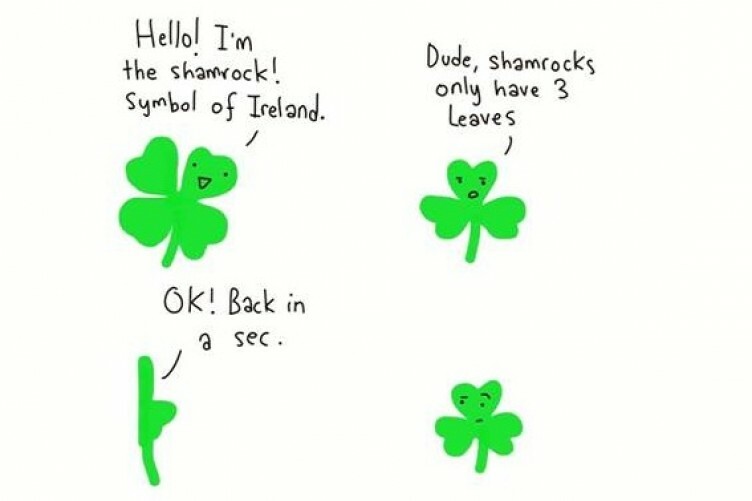 As per usual I'll point out the frustration of many Irish each 17th as misinformed people like those at WG present a 4 leaf clover as a shamrock. Kind of a tradition for me at this stage after so many years of pointing this out to WG time and time again. 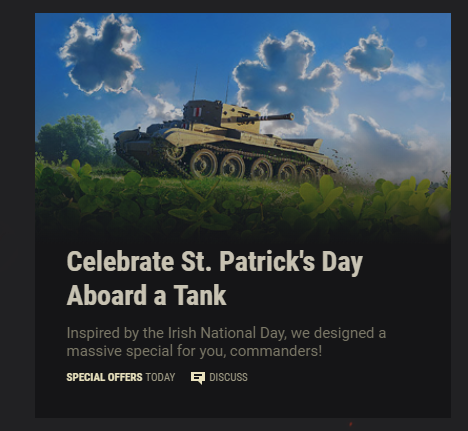 Also can someone please explain to me why of all nations and tanks is the cromwell on the banner for St Patrick's Day? does WG need a history lesson on which countries have invaded and slaughtered the Irish? We are celebrating Ireland with a tank on the banner named after someone who slaughtered our people and invaded our country? hello? What the hell is wrong with you WG? Does each mark on the barrel signal so many hundred or thousand Irish killed by the tank also or what? It's so insensitive, obviously someone just didn't make the connection but would you be celebrating a Polish holiday or Russian victory day with a Tiger II on the banner or Maus. Edited by DaMP13R, 15 March 2019 - 11:20 AM. 10% not that unusual wasn't it the norm to offer 50% up to tier five 30% for tier six and seven then 10% for eight and up. 30% is more a once a year thing twice if we are lucky. Just unlock tanks then wait for the opportune moment to buy equip and crew them.